S&P500 Tick1K Index is a custom market breadth index built with a similar principle like the NYSE Tick Index. Since the S&P500 Tick1K Index contains only the S&P500 components, it is cleaner and more robust in terms of trend quality and signal quality. The unique way I designed this Tick Index makes it very useful for day trading Emini S&P. Here is an introduction of the index itself and its advantages over the NYSE Tick Index. What Is S&P500 Tick1K Index? Tick1K is short form for summation of the last 1024 ticks for a stock. A Tick is the direction of a trade for which a trade at or above previous traded price is evaluated as +1 while a trade at or below the previous traded price is evaluated at –1. Tick1K Index is the average of Tick1K of the components within a predetermined basket. Hence, S&P500 Tick1K Index is the Tick1K Index of the S&P500 components. It sounds very complicated and indeed it is. Unlike the NYSE Tick Index, which just takes a snapshot of the last Tick value for all the traded stocks at NYSE regularly, S&P500 Tick1K Index is many times more computational intensive as you need to keep track of the last 1024 trades for all the 500 stocks involved. 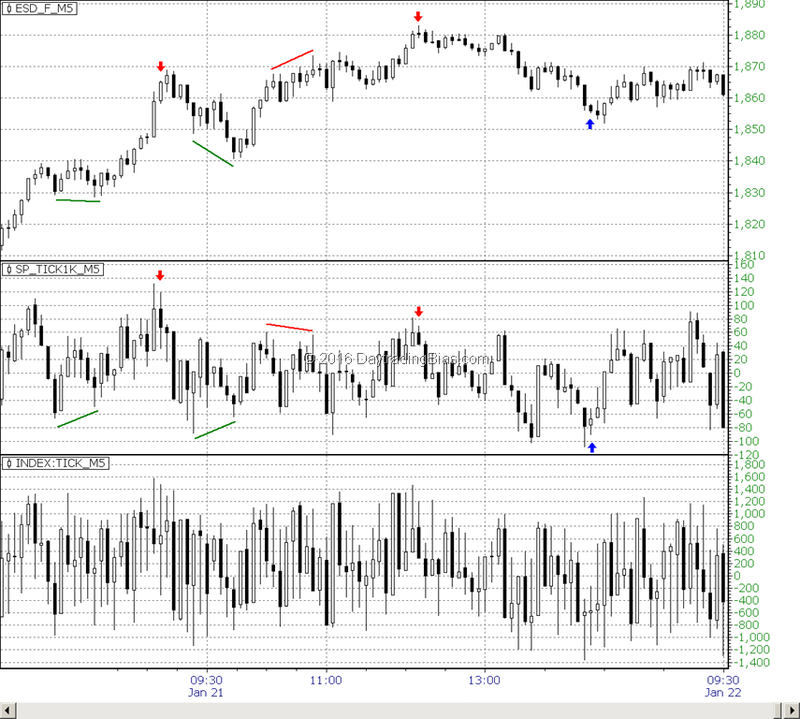 Here is a chart of Emini S&P with S&P Tick1K Index and NYSE Tick Index on 5-min chart. On the first glance, both NYSE Tick and S&P500 Tick1K Index looks similar. They swing in similar fashion but there are subtle differences between the two. I will explain this in more details below. NYSE Tick Index is a snapshot or sliced sample, so to speak, of what is happening at the moment with the NYSE stocks. Hence, statistically it carries no memory effect and it has no summary information on individual components. This limited the index to be useful on relative comparison basis only. Its interval summary (e.g. every 5 minute like the example above) are noisy, making the bar to bar comparison not as useful. S&P500 Tick1K Index is a summary index of summary information for each component. This makes the index carry full memory effect with bar to bar transition information meaningful. Hence S&P500 Tick1K Index is less noisy, with more meaningful extremes in the data collected. In other words, S&P500 Tick1K Index is a much more evolved version of the NYSE Tick Index. It has many advantages over the classic NYSE Tick Index. If you are day trading Emini S&P, the S&P500 Tick1K Index can give you an edge you may never experience before. S&P500 Tick1K Index has a very strong open to close correlation relationship on its 5-minute, 10-minute and 15-minute bars with the corresponding Emini S&P bars. NYSE Tick Index does not have this property at all due to its noise level. 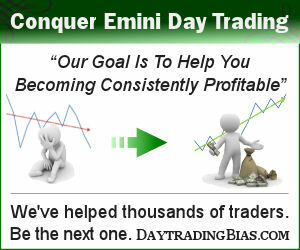 The implication is that you can actually trade the Emini S&P without even looking at the Emini S&P chart. You can apply the classic chart reading techniques on the S&P500 Tick1K Index with trend lines, channels, etc. just like what you do on the Emini S&P charts. For example, taking trend line break signals on the S&P500 Tick1K Index will result in entering a trade from the trend line break on the Emini S&P at similar time, if not earlier. Comparing to NYSE Tick Index, S&P500 Tick1K Index does not have all these long tails as you see on the chart above. Hence you can identify and confirm the current short term trend in Emini S&P using S&P500 Tick1K Index. When trend is clean, we can then identify the waves of buying and selling much easier. NYSE Tick Index at times can produce a clear sign we are having a 3 pushes up pattern confirming the price actions in Emini S&P. But most of the time it is just too noisy for us to be sure. S&P500 Tick1K Index outshines NYSE Tick Index in this area with very clean waves for easy identification. There is really no guess work. Once you monitor the index in real-time for a while, you will see how this works. I marked on the chart with two red down arrows and one blue up arrow showcasing a unique property of S&P500 Tick1K Index. Since the index has a high correlation with Emini S&P open to close relationship on various timeframes, when a wave ended with S&P500 Tick1K Index turning first on open to close basis within a bar before Emini S&P does, you know the current wave is about to end. NYSE Tick Index does not produce similar patterns with its bars. 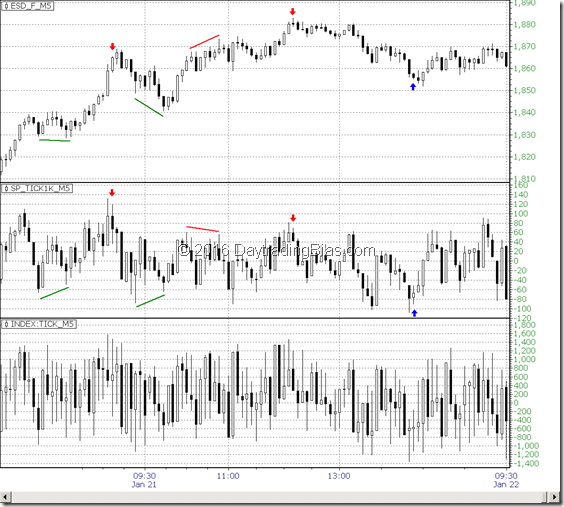 First, its noise leads to more disagreement on open to close relationship between itself and Emini S&P. Second, NYSE Tick Index also produces noisy trend which makes it harder to tell how long the trend has been in place. Hence we can see similar pattern with NYSE Tick Index, but in reality, it is much harder, if not impossible, to use NYSE Tick Index for this purpose. I have marked up the chart above with bullish divergence setups (green lines) and bearish divergence setup (red lines). Again, the clean swings make it much easier to see how the divergence is forming. The bounded range behaviour with S&P500 Tick1K Index can help us gauge the strength of the divergence. The bounded range is a by-product of custom market breadth that is based on a fixed basket size of components. Comparing to NYSE Tick Index, which is based on all the traded instruments on the trading day, the number of stocks can change drastically over time and also significantly between morning hours and closing hours. Mechanical signals generated from S&P500 Tick1K Index enjoys better long term stability as it is based on components that are more actively traded than many of the issues traded at NYSE. After collecting S&P500 Tick1K Index data for many years, one thing I notice is that when NYSE Tick Index generates false signals during high volatility period, the S&P500 Tick1K Index often generates signals in the opposite direction. The main reason for NYSE Tick Index producing more bad signals is that higher volatility leads to more noises in the index itself. Using averages or other filtering techniques do not help much as it is the raw data collected being defective. Discussions on mechanical signals and statistical biases with S&P500 Tick1K Index will be presented in separate articles. I know the question will come up quickly so I will answer this here before I receive way too many emails asking the same question. If you are not interested in the topic you can skip this section. Since I invented NeoBreadth technology more than a decade ago and integrated that with NeoTicker, there is no other platform on the retail market that is capable of collecting customizable market breadth data. Hence, do not waste my time asking whether a particular platform you are using can do the same. The answer is still a “No” as of year 2016. NeoTicker was built from ground up for the purpose of tracking thousands of markets in real-time on a tick-by-tick basis. If a platform is not built with that in mind in the first place, no matter how fancy their charts and order routing have become, these platforms will break down even on the fastest computer you can purchase when you start to track several hundred symbols on them. NeoTicker can track several thousand symbols in real-time, crunching several hundreds market breadth indices without even putting on 10% CPU load on an average desktop computer. I have licensed the technology to institutional clients over the years. Hence retail traders are really trading in the blind while these firms having the advantage all along. As majority of retail traders never heard of the technology, let alone learning the possibilities of having such advanced market breadth information on hand, the retail traders are limited to aged trading methodologies that may not be useful in the current trading environment at all. The company that owns NeoTicker has all its focus on its institutional clients now. Hence the availability of NeoTicker is very limited and there is not much resources made available to the public on how to utilize all the powers within NeoTicker. Even if you obtain a copy of NeoTicker, you still lack the expertise in market breadth analysis to benefit from the platform. My solution to this dilemma is quite simple. I am going to make some of the real-time custom market breadth and my research on their usages available. This should allow the retail traders access to some of the more advanced trading tools mainly available to institutional traders. The generic NYSE Tick Index and its cousins like Nasdaq Tick Index are functional market breadth data but they are no longer that reliable. Partly due to the much higher volume in trading activities comparing to the era for which the concept was invented, and partly due to the use of automation in market making and trading in general, these classic Tick indices have become more noisy over the years. More noise means more false signals which is not desirable. S&P500 Tick1K Index has been working wonders for many years not only because it is statistically more sophisticated, it is also because it is not accessible by majority of traders. From what I see, mainstream financial institutions will continue to preach the same old thing while the internet will be flooded with misinformation on trading. I am quite sure S&P500 Tick1K Index will continue to perform in years to come. S&P500 Tick1K Index will be part of the real-time custom market breadth charts that I plan to introduce this year for my premium members. It will be interesting to see if it is going to be well received. How did you settle on 1024 ticks? It depends on where the real-time chart project will take us. The custom breadths included may change in this develop stage. Once we settle down to a stable set we can generate historical charts and upload them online. Firstly, I can’t thank you enough for sharing your insights with us Lawrence. I cannot speak for the company itself but I do know that they are still supporting the retail version of NeoTicker. At this point, NeoTicker still works fine with eSignal and IQ Feed as far as I know. I’m using NeoTicker + eSignal everyday. Due to my hedge fund need, I am porting trading strategies mainly written for NeoTicker and connected to Exchange direct execution, into Tradestation and other platforms. The difficulty is there. What I see is that going forward there exists a space for NeoTicker’s computation core to be integrated with these front end platforms. Whether retail traders are willing to look into such toolset is a completely different story. The most interesting thing though is that none of these “trading platforms” have catch up with what NeoTicker can do since some 10+ years ago. I don’t see that in the near future (10 to 15 years) that we will go into 128-bit computing due to global economic slowdown and other technical factors. Hence it is likely the current NeoTicker will survive for a long time.